Feel Good Sunday: How Smart Are Horses? Dogs are celebrated everywhere these days for the clever things they and their brains can do, and the science of dog cognition continues to soar in popularity. As a cat person, I can’t help but add that cats, too, show off their savviness for science. Now, some cognitive scientists are asking about another domesticated animal companion that’s been comparatively neglected: horses. Japanese scientists Monamie Ringhofer and Shinya Yamamoto of Kobe University have published online in the journal Animal Cognition the results of the first research to investigate how horses respond to the state of knowledge or ignorance of their human companions. The results are impressive. Ringhofer and Yamamoto designed research to test eight thoroughbred horses in a paddock at Kobe University’s equestrian club. The horses watched as a research assistant put a carrot in a food bucket. The bucket wasn’t accessible to the horses, only to a human caretaker. In one experimental condition, the human caretaker witnessed the food going into the bucket (knowledge state). In a second condition, the caretaker did not watch as the carrot was placed into the bucket (uninformed state). The horses’ responses were videotaped and compared between the two conditions. The horses used more visual and tactile signals with the uninformed than the informed caretaker. The horses increased how much they looked at, touched and/or lightly pushed the ignorant caretaker (compared to the caretaker in the know) to get them to realize where food was hidden. The authors acknowledge that follow-up studies are needed. It’s an important result, though, because it points not only to advanced cognition but also to flexible cognition, with the horses adjusting their communicative behavior to the humans’ knowledge state. “This study is the first to show that horses possess some cognitive basis for this ability of understanding others’ knowledge state in social communication with humans,” Ringhofer and Yamamoto write. Some non-human primates do this but, of course, horses are evolutionarily far more distant relatives of ours than chimpanzees. So what about dogs: How do they respond? Ringhofer and Yamomoto write that in a similar experiment carried out by other researchers, dogs didn’t do what the horses did — they didn’t look at, touch or push their caretakers. Instead, the dogs alternated their gaze between the uninformed human experimenter and the hidden food’s location. In other words, the dogs directed the humans’ attention also — just in a different way. It could be that it’s, perhaps, in keeping with their different evolutionary history as herding, hunting, service and rescue animals. Each species has in its own way fine-tuned a skill leading to effective communication with humans. Lead researcher Ringhofer said, via email, that not all the horses responded during the experiment in the same way. This is interesting and also expected: Animals’ behavioral tendencies and personalities vary. 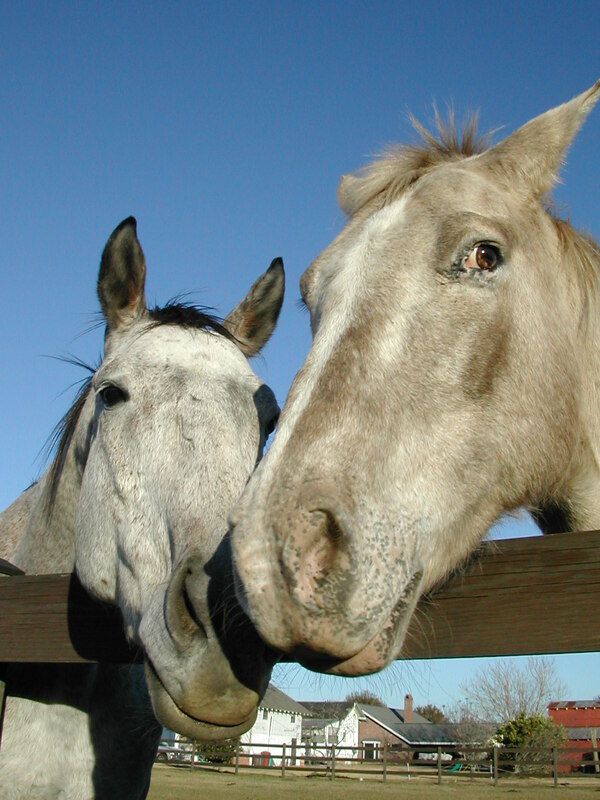 “Most horses used visual and tactile signals to request the [attention of the] caretakers. However, two horses seemed to use extra behavior. They stood near the caretaker and located their face in front of the caretaker (very close to the caretaker’s face). Then, both of them finally hit the caretakers’ face with their face,” Ringhofer said. Ringhofer couldn’t determine if the face-hitting was accidental or purposeful on the horses’ part, and so didn’t include it in her analyses. But she does wonder if those two horses might have come up with quite a startling way of social signaling! Direct comparison of intelligence across species doesn’t work well, because there is no single standard of what “smart” means across differently evolved animals. Asking if horses and dogs are equally smart, then, doesn’t really make much sense. The bottom line here is all about the horses themselves. Together with other recent research showing that horses can use symbols to communicate with humans, this new study tells us that horses think carefully about what’s going on around them. Reblogged this on A Few of My Favorite Things…. We try to post positive articles on Sunday. Being that many of us have horses as companions know this to be true, obviously, but there are many readers out there that do not have the luxury of staring into equine eyes everyday; they appreciate the verification that their hopes and beliefs are valid. Such documentation helps to further that issue. I believe that much depends upon how much of any human’s attention & caring is given to an animal – any animal! Years ago I boarded at a hack stable – where horses were regularly brought from auction (Unadilla-not one of the best). It seemed when they first were brought in – there were many that didnt interact with people – seemed standoffish – maybe not had good caretakers before, I think the same is true of most animals that havent been cared for. The more interest their owner takes in them – the more personality pops out – the more interest they have in their humans! BUT never doubt their intelligence! It’s good to see that animals’ intelligence is being acknowledged! For too long we’ve been the center of our own universe. Oreste the donkey didn’t fancy jumping over a fence, as his pals Pedro and Domenico had just done.